Well. Finally I have come to the end of all the sawing and chiseling and have the framework assembled. It’s all (roughly) flush. At the moment it’s very slow as I only have three G-clamps, even with a bit of borrowing. So I’m using the work-bench to clamp one side at a time and using the clamps on the cross-pieces. 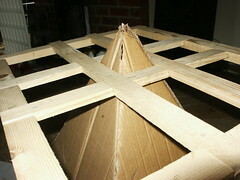 If I leave each one to dry it will be Tuesday evening before I can glue the cardboard top on. But I’d rather take a few days now to get it right rather than cut corners and regret it. Especially as the previous table lasted over a year and I think this one could last longer. So it’ll go a bit quiet now while I work on the decoration and wait for the glue to set and keep moving the clamps around!